DO YOU FEEL LIKE SAILING IN CORFU? Yes, I feel like sailing! Thinking of sailing in Greece? Don’t think twice because there is no better way to explore the Greek islands and its coastline than from a boat! A group of Greek islands that you don’t want to miss out on are the Ionian islands, bathed by the Ionian Sea. Both the South Ionian Islands (South Ionian) and the North Ionian Islands (North Ionian) are characterized by suburb sailing conditions, deep blue waters, exotic surroundings and a pleasant Mediterranean climate. Not to forget its fascinating culture and history. We will talk about the North Ionian Islands and share some of its most interesting and beautiful places that can be visited by boat. We created a 7 day North Ionian sailing itinerary that will offer you a memorable sailing holiday in Greece with family, friends or your partner. When we talk about the North Ionian, we refer to the island of Corfu (Kerkyra in Greek), the Paxos and Antipaxos Islands, including some of the scenic places along the Greek west coast. DO YOU FEEL LIKE SAILING AROUND CORFU? For this sailing trip in Greece, we highly recommend to rent a sailboat or catamaran for a week. Renting a yacht is also a popular option. If you want to further explore the Ionian Islands, definitely charter for two weeks. Of course, this choice also depends on your experience. If you have a sailing license and prefer to be your own captain - go for a bareboat rental. Don’t want to worry about a thing and prefer to fully relax? In this case we recommend you a skippered charter or a crewed charter. The easiest and fastest way to reach the North Ionian islands is to fly to Corfu airport. During summer there are loads of charter flights departing from Europe, such as EasyJet, Ryanair or Jet2.com. Corfu airport receives also domestic flights, mainly from Athens or Thessaloniki. Whereas if you want to reach Corfu by ferry, it departs from Igoumensita and Patras. Ferries to Corfu also depart from Italy, such as Venice, Bari or Ancona. From Corfu airport you can grab a taxi that will take you to Gouvia Marina, your starting point, in about 15 minutes. To sail through the Ionian you don’t need to be highly experienced. At most times, sailing is not very challenging. During the sailing season, starting from April to October, sailors can expect warm weather, gentle winds and calm waters. The winds come from the North West, building up around midday and dropping again at sunset. This allows you (most of the times) to anchor in a safe place without having to worry about the winds. Your sailing vacation in Greece will start in Gouvia Marina, from where you will collect your charter boat. Gouvia Marina is located just around 6km away from Corfu Town and offers all kinds of facilities. Before check in at 17:00, you might want to relax and stretch your legs at one of the waterside tavernas; enjoy your first traditional Greek meal and buy the provisions for your sailing trip in Greece. If you feel like it, there is also the opportunity to spend some time at Gouvia beach or its private swimming pool. Once settled in, it’s time to explore the town of Corfu, an UNESCO World Heritage Site. This is no wonder with its intriguing history, majestic architecture and rich cultural identity. 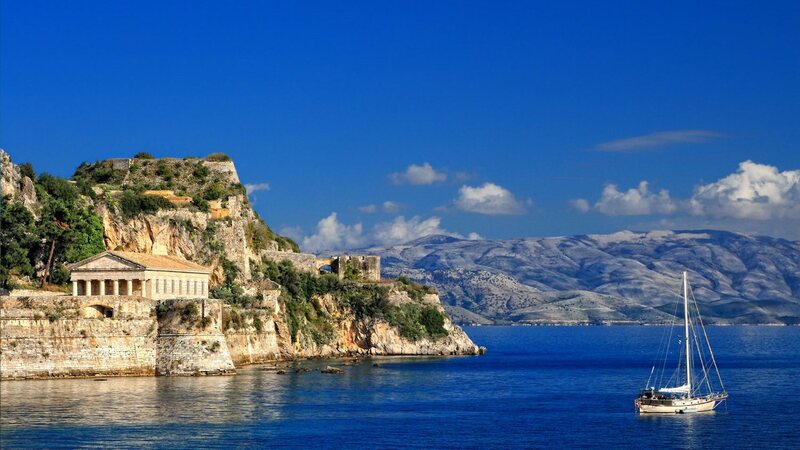 Named after a beautiful nymph Korkyera in Greek mythology, Corfu has been dominated by many conquerors, such as the Venetian, Sicilian, French and English. Lose yourself in the cobblestone streets and admire the ancient and high-class buildings. Explore the hidden gardens, enter in one of its vibrant shopping streets, and discover one of the most traditional cafes and restaurants. Must-visits of Corfu are the splendid Liston arcade and the Old Fortress, which offers impressive views of the sea and the historic town. Your first day on the Ionian waters will take you far out to the Sivota islands, on mainland Greece. Now that you are fresh and full of energy, set sail and cruise for around four hours and a half. You will soon notice that sailing in the Ionian Sea is a real pleasant experience. Sivota, a traditional charming fishing town, is rather popular for its enchanting little islands. Indeed, with its luscious greenery, clear turquoise water, and white little coves - Sivota is considered as one of the most exotic destinations in Greece. Make a first stop at the famous Blue Lagoon. Recharge your batteries at the beach and later discover its bluer than blue coves. Explore Sivota’s natural bays and prepare your snorkeling set to admire the marine life of the Ionian Sea. If you are not too tired, definitely visit the most exotic beach of Sivota, Bella Vraka. Be captivated by its characteristic shore and different temperatures of water. Spend the night in one of the quays of Sivota town and close the day with a cocktail or some ice cream at the ‘Bamboo Place’ - the perfect spot to witness an incredible sunset. Let the gentle winds carry you to the idyllic Parga, a classic postcard Greek town, on the mainland of Greece. As soon you enter the bay of Parga, you will be amazed by its picturesque atmosphere. Its amphitheatrically constructed colorful houses, its beaches, its lush greenery and the blue sea make Parga a little pearl of the Mediterranean. Once a traditional fishing town, today Parga is well-known for its lively island style. Want to find a yacht to sail around Corfu? Anchor at the most western side of Valtos beach, where you will also stay for the night. In for a little adventure? Go kayaking, water skiing or parasailing. Then continue for a gorgeous walk up to the old town of Parga and enjoy some authentic Greek food at the popular Taverna Stefanos. You can’t leave Parga without visiting the historic Venetian Castle, offering the most incredible views of the bay. Wander among the labyrinth-like alleys and enter in one of the little boutiques or shops selling handmade leather goods. Don’t feel like walking? Grab the water taxi back to your anchorage. If you still have some energy, we suggest to have a peaceful dinner at the restaurant of ‘Cape North West’. If not, enjoy a quite dinner on deck of the boat. You are already halfway through your one week cruise in the Ionian Islands. Take this day to cruise around the little paradisiacal island of Antipaxos. Antipaxos is part of the Paxi Islands, together with its neighboring island Paxos. With its turquoise waters, incredible beaches, and unspoiled nature, we can tell you that sailing in Antipaxos is a true spectacle for the senses. Covered with olive trees and vineyards, this small green piece of land is almost inhabited and home to only a few houses and tavernas. We suggest to first sail around the island and to anchor in one of its fantastic private coves. Discover the waters where the Gods once lived and be enchanted by its divine scenery. Take shots of the photogenic bays of Rodovani and Sarakiniko. Reach the beach of Vrika and jump off your boat to have a delightful late lunch at the Spiros taverna. Whether you are into a Greek Salad, hummus, Dolmades, Gyro or Octapodi – they have it all. For the wine lovers, don’t forget to take a sip of Antipaxos’ local wine. Then anchor in the popular bay of Voutoumi beach and relax the rest of the day. Voutoumi is known for its breathtaking settings, striking blue waters and snow white sand/pebbles. If the weather conditions allow you, stay the night in the bay of Voutoumi. As a plan B we recommend you to moor at Mongonissi, which is just about 2 nautical miles away from Antipaxos. Paxos, together with Antipaxos, is a top destination of your boating holiday in Greece. The combination of welcoming people, picturesque harbors, stunning beaches, incredible caves and immaculate waters make Paxos a real pearl of the Ionian Sea. Interesting to know is that Paxos is full of olive trees, once being planted by the Venetians. You will soon feel that sailing around Paxos is a totally unique and memorable experience. Sail north towards the biggest port of Paxos, Gaios. Either enter Gaios from a northerly or southerly direction, passing two characteristic small islands. Be amazed by its great ambience and enjoy its neoclassical buildings, coffee bars and little boutiques. We then suggest to explore the west coast of Paxos, which is the most unspoiled and authentic one. The coast is full of treasures, such as the photogenic Tripitos Arch, an imposing rock that is part of a collapsed sea cave. Soak up the stunning scenery of Erimitis beach and indulge in some swimming and snorkeling. Cruise until you reach the northernmost port of Lakka, a horse shoe shaped bay. This is the perfect site to moor your boat and to admire its turquoise waters. The ‘Arriva’ restaurant is a place where you can eat incredible seafood and get a glimpse of the sunset on the water and the flickering harbor lights. Your sailing vacations in Corfu and the North Ionian Islands is coming to an end. Though, there are still plenty enough spots to discover. Wake up a little later as usual and spend the morning in the bay of Lakka. Start the day with a coffee and a traditional Greek breakfast in one of the local bars. Feel like going for a walk? There are loads of interesting tracks, walled paths and trails to be discovered. Be surrounded by olive trees and take pictures of the ruins and church. If you prefer to spend the morning in a more relaxed way, rent a sunbed at one of the pebbled beaches. When you feel ready, set sail to Petriti and step foot again on the island of Corfu. Petriti is very calm and you’ll be mingled with the indigenous inhabitants. Go and have dinner at one of the historic tavernas and watch the fishermen return with their catches. Sit down among the locals and try the best and freshest grilled octopus you have ever eaten in your life. Other traditional plates are cuttlefish, squid, anchovies, sardines, whiting and mussels. Don’t be surprised you will be served a whole fish with the head still on! Finish the day with a coffee or a delicious glass of wine on deck of your boat and really enjoy the peacefulness of Petriti. The last day of this sailing trip in Greece has already arrived. From Petriti, cruise north along the eastern coastline of Corfu. Before heading back to the marina of Gouvia, drop anchor in Benitses - one of the old traditional villages of Corfu. Be welcomed by friendly and hospitable locals at a traditional taverna, go for a quick hike into Benitses’ green mountains, visit the characteristic Archilleion palace, take a picture of the popular Leopetra rock or just relax and get comfortable on Benitses’ Chontrakia beach. As a last stop of our sailing Itinerary, we recommend to explore the picturesque Vlacherna monastery. There are hundreds of many little monasteries on the island but this one cannot be left out. The small monastery offers a great view and is far away from the noise of Corfu Town. If you have seen the James Bond movie “For Your Eyes Only” you might even recognise it since it is present in one of its scenes. 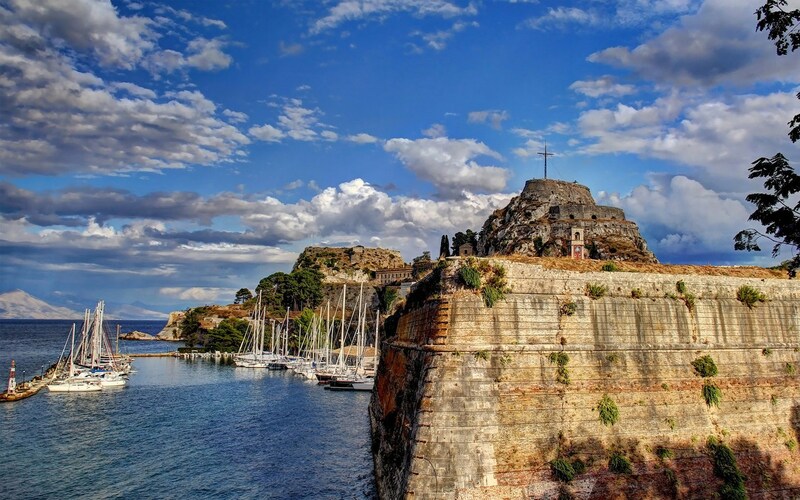 Step in your boat again and enjoy, once again, the scenery of Corfu’s fortress from the water while sailing back to Gouvia Marina. Note that you will need to be back in the marina at 18:00. However, you won’t have to leave your boat until the following morning at 9:00am. This means you have the evening to spend some more moments, either in Corfu Town or Gouvia. Or simply decide to enjoy your vessel and have a last dinner on deck. We are pretty sure that sailing in Corfu and the other North Ionian Islands we have mentioned will leave you with a unique and unforgettable experience! If you have any questions regarding the itinerary or boat rentals in Greece, send us an enquire clicking in the button. TIP: if you have time left or decide to stay longer, sail along the west and north coast of Corfu and visit iconic places such as, Myrtiotissa beach, Paleokastritsa, Porto Timoni beach, and Sidari. 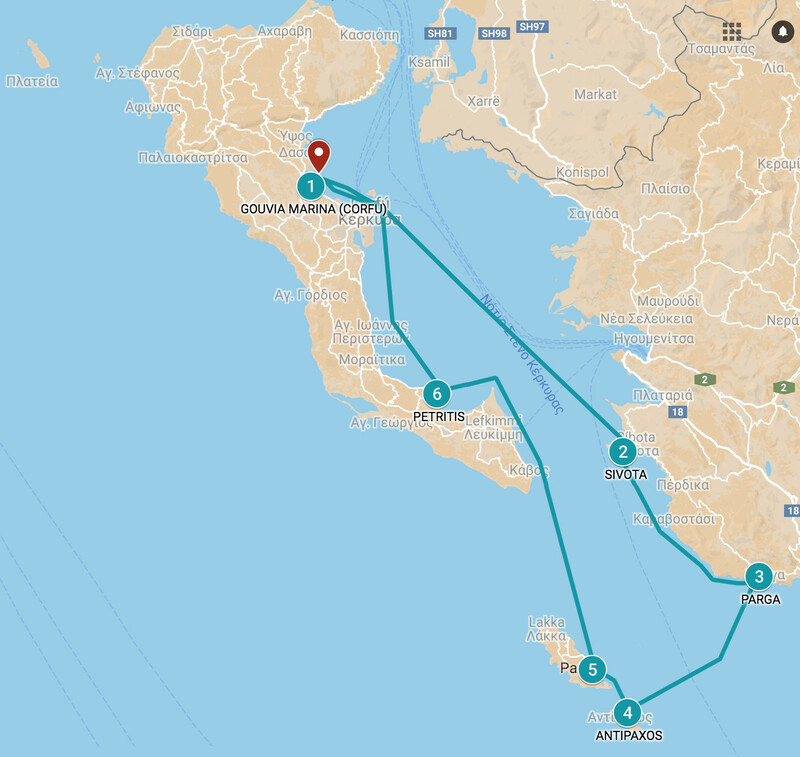 What do you think of our sailing trip in Corfu and the North Ionian Islands? Hola Susana, te contactaremos por email para solicitarte algunos detalles, resolver tus dudas y ayudarte a organizar tus vacaciones en barco por las Islas Jónicas. Un saludo, El equipo de Yanpy.